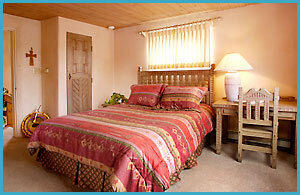 The Trujillo is one of the original rooms dating back to the 1850’s and has been beautifully refurbished. 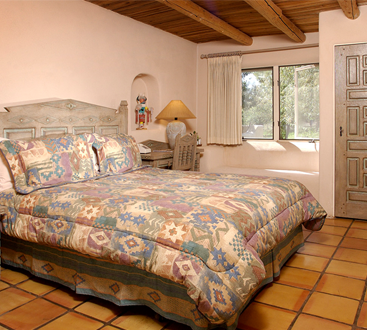 This room comes with coved ceilings, vigas, a beautiful corner kiva fireplace, and a queen-size bed set under an arch. Original art by Bunny Oliver, one of our guests from Austin, Texas, hangs over a peach colored leather love seat which is set in another arch. The private bath has a steeping tub surrounded by talavera tile from Mexico. The French doors provide an exterior entrance from the portal where one can sit and enjoy our sunny blue skies, gardens. and the beautiful Taos Mountain. 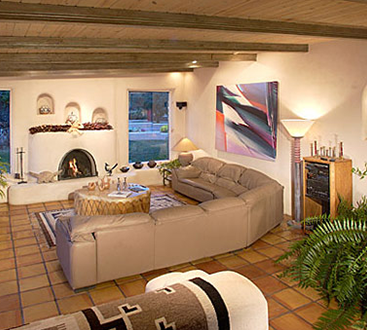 It certainly offers views and experiences that no Taos hotel ever could! 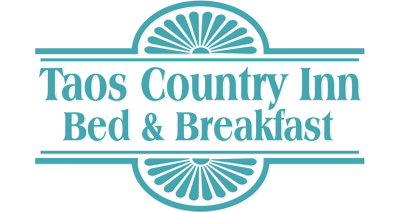 No need to settle for just any Taos lodging when you can have a romantic stay at a romantic bed and breakfast. Click below to book your stay today!